The Summary of Diagnosis Presentations for the September 2013 meeting of the ICD-9-CM Coordination and Maintenance Committee has now been posted on the CDC website. • Supporting clinical references and literature should also be submitted. Proposals should be consistent with the structure and conventions of the classification. For the proposals to insert Somatic symptom disorder (SSD) and Illness anxiety disorder into ICD-10-CM as inclusion terms under existing F45 Somatoform disorders codes (as listed on Page 45 of the Diagnostic Agenda/Proposals document), no descriptions, no rationales and no supporting clinical references and literature were set out in the Diagnostic Agenda/Proposals document nor presented at the September meeting. The requesters for each of these additional 17 insertions/changes listed under “Additional Tabular List Inclusion Terms for ICD-10-CM” remain unclear. If you have comments or objections to the proposed insertion of Somatic symptom disorder (SSD) or in relation to any of the proposals requested via the September ICD-9-CM C & M Committee meeting, please have your submissions in, via email, to Donna Pickett nchsicd9CM@cdc.gov by November 15. Information in this report relates to American Psychiatric Association (APA) proposals, submitted via the September ICD-9-CM/PCS Coordination and Maintenance Committee Meeting, for the inclusion of a number of additions to the forthcoming US specific ICD-10-CM. ICD-9-CM is the official system of assigning codes to medical diagnoses in the United States. Next year, ICD-9-CM will be replaced by ICD-10-CM, scheduled for implementation on October 1, 2014. The DSM is widely used by CMS contractors, federal and state agencies and medical insurers to indicate eligibility for provision of services. Since the official codes required in the United States for records and reimbursement purposes are ICD-CM codes, DSM diagnoses are cross-walked to the closest approximation of ICD-CM codes to classify diagnoses for insurance claims, research, data capture and other public health purposes. The ICD-9-CM and ICD-10-CM coding systems are subject to annual revisions by NCHS and CMS via public review meetings held twice a year (in March and September), followed by brief public comment periods. October 1, 2011 saw the last major update of ICD-10-CM/PCS until October 1, 2015. Between October 1, 2011 and October 1, 2015 revisions to ICD-10-CM/PCS will be for new diseases/new technology procedures, and any minor revisions to correct reported errors in these classifications. Regular (at least annual) updates to ICD-10-CM/PCS will resume on October 1, 2015. The ICD-9-CM Coordination and Maintenance Committee will continue to meet twice a year during this partial code freeze. At these meetings, the public will be asked to comment on whether or not requests for new diagnosis or procedure codes should be created based on the criteria of the need to capture a new technology or disease. Any code requests that do not meet the criteria will be evaluated for implementation within ICD-10-CM on and after October 1, 2015 once the partial code freeze has ended. At last month’s Coordination and Maintenance Committee meeting, APA presented seven diagnoses that are new to DSM-5, along with proposals for new codes for addition to the ICD-10-CM . APA states that the new codes, if approved [by NCHS/CMS], would probably not be added to ICD-10-CM until 2015. The following disorders were proposed by APA for inclusion in ICD-10-CM (Pages 32-44, Diagnosis Agenda). Dr Regier’s presentation starts on Day Two of the meeting, video Part 4, 13:50 mins in from start and concludes after PMDD. 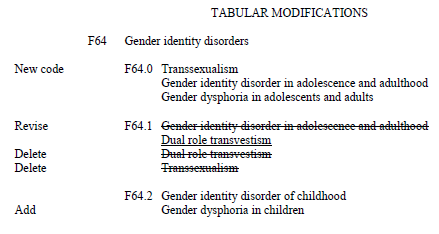 Additionally, the APA has petitioned for revisions to the ICD-10-CM listing for gender dysphoria in adolescents and adults, which is not a new disorder. Dr Regier’s presentation concluded with recommendations for PMDD. None of these 16 proposed additional inclusion terms to the ICD-10-CM Mental and behavioural disorders (Chapter 5) F codes, as listed on Pages 45-46, were presented or discussed by Dr Regier on behalf of the APA but presented briefly and en masse by Donna Pickett. I have pasted screenshots from the Agenda at the end of this report [Ref 5]. Ms Pickett introduced this section of the Agenda on Day Two, video Part 4, 1 hour 22 mins in from start. With no discussion taking place on rationales for individual proposals and no comments or questions being received from the floor or by phone link, Ms Pickett moved swiftly forward to introduce the next Agenda item. 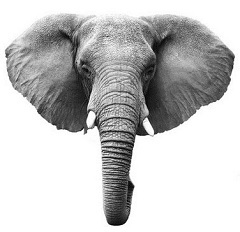 Since these proposals are unattributed in the Agenda, the provenance of these additional 16 code change requests is unclear (that is, whether the requestors are CMS/CDC, Collaborating Centre for the WHO-FIC in North America, WHO ICD-10 Update Committee, WHO ICD-11 Revision, APA or other petitioners). If the addition of new DSM-5 disorders Somatic symptom disorder and Illness anxiety disorder had been proposed by the APA, it is unclear why these were not included within Dr Regier’s presentation for discussion. Blink and you might have missed the proposal to incorporate Somatic symptom disorder and Illness anxiety disorder into ICD-10-CM – so little time and attention being devoted to this section of the Agenda. Note that Hypochondriasis (Illness anxiety disorder) is proposed to be included in the ICD-11 Beta draft under dual parents Obsessive-compulsive and related disorders and Bodily distress disorders, and psychological and behavioural factors associated with disorders or diseases classified elsewhere. and also on the CDC’s website page for the meetings. There is an ICD-9-CM and ICD-10-CM/PCS revisions Timeline set out on pages 3 thru 7 of the Proposals PDF . The deadline for receipt of public and professional stakeholder comment on any of the proposed ICD-10-CM/PCS code revisions discussed at the September 18-19, 2013 ICD-9-CM Coordination and Maintenance Committee meeting is November 15, 2013. Full contact details for submission of comments/objections to NCHS/CMS are on page 8 of the Proposals PDF. The meeting co-chairs state that electronic submissions are greatly preferred over snail mail in order to ensure timely receipt. Whether you agree with a proposal, disagree (and why), or have an alternative proposal to suggest. But also to comment on the timing of those proposals that are being requested for approval for October 2014. Does a proposal for a new or changed Index entry and Tabular List entry meet the criteria for implementation in Oct 2014 during a partial code freeze or should consideration for inclusion be deferred to Oct 2015 implementation? And separately, comment on the creation of a specific new code for the condition effective from October 1, 2015.